Goldfish are small fish which are usually found in red or orange color. These are often kept as pets in ponds or bowls. Goldfish are considered as the far-off relatives of carp. Goldfish are popular as aquarium fish all over the world because of its vivacious and attractive looks. These are hardy fish and require less care to than other aquarium fish. So, having a goldfish in your aquarium will not be demanding for you as they require very little attention from you. There are numerous species of goldfish which are all characterized by their external attributes. However, there are some common features in them also such as they all have extended bodies, red backs, golden sides, yellowish red bellies and orange to yellow fins. This article will definitely interest the readers who have reverence for this little aquatic creature. As the name suggest, it is commonly found goldfish in variety of colors such as orange, red, brown and blue. Common goldfish have high tolerance to cold water and are called cold water fish as well. Common goldfish are not good in sharing ponds or aquarium with other fish, especially tropical one. A comet goldfish is another beautiful and vibrant fish. Because of its flexible nature, it is best for the beginners to start with. Comet goldfish have long, slender bodies along with long tails. These are found in red, orange, white, and yellow colors. Their long tail helps them to swim swiftly. These are best for garden ponds. Its unique color makes it a best choice for the fish lovers. 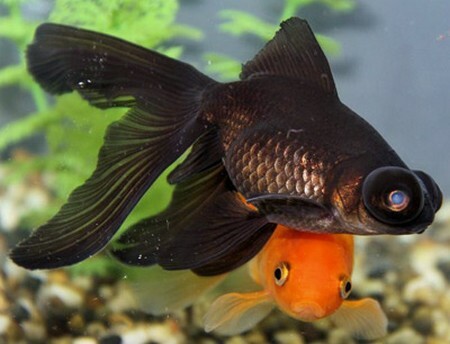 A black moore is a type of goldfish with short, round stomach, two big eyes on the sides of the head and a split tail fin. A black moore is normally 7 inch in length and 2 inch in width. An average lifespan of a black moore is about 17 years. Black moore is sociable and genial by nature and can share the pond with other varieties of goldfish. The bubble eye goldfish is a fish having eyes on each side of the head pointing upwards and under both of its eyes it, it has large bubble sacks. It is given this name because of the presence of these bubble sacks under its eyes. It is important for you to make certain that the aquarium in which this fish is kept doesn’t contain any sharp or pointed object because they can burst the bubble sacks. Though, the bubble sacks come back with the time but they may not be like the original bubbles. This will result in two contrastive shapes of bubble sacks on each side giving your fish an awkward appearance. 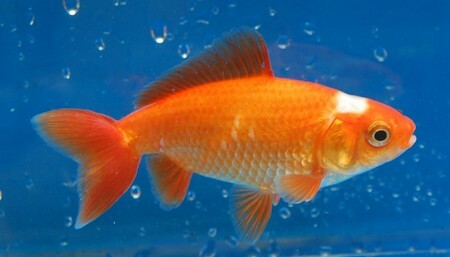 The bubble sack goldfish was originated in China. It is recommended not to keep your bubble eye goldfish with other vigorous varieties of goldfish. Ryukin is a species of goldfish that displays ostentatiously a humpback right behind its head. This species of goldfish possesses a calm and relaxed nature. The diet of the ryukin is normally based on vegetarian protein mixture. An average size of this fish is 6 inch and found in different colors such as calico, orange, white and red. Ryukin is known for its exploring habit so introducing a plant or two in the aquarium will definitely please this fish. Crown pearlcale is another gorgeous looking goldfish. It is given this name because of the presence of creamy-white scales on its bodies which appear to be like pearls on its round body. Crown pearlscale is normally found in red and white colors. However, it is also found in red, blue, black, calico, chocolate and red/white. It is kind but impetuous species. Fantail goldfish is a fish with oval-shaped body. It has high fins on the back. 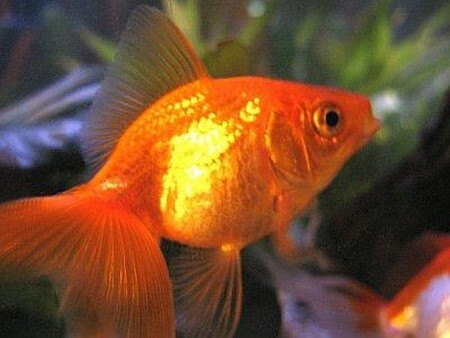 Fantail goldfish has an average lifespan of 20 years and is found in different shades of orange, i.e. black/orange, or white/orange. This color combination certainly gives it a lot of admiration. For beginners, this can be a good choice because these are less demanding. 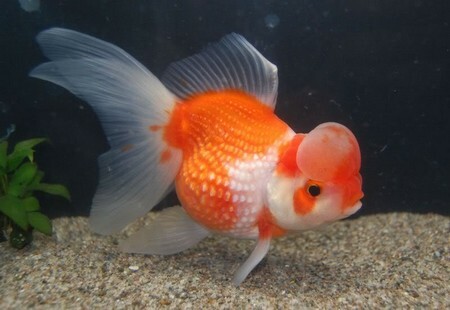 Oranda goldfish is known for its unique looks which make it a popular choice as aquarium fish. It is found in variety of colors such as red, blac, calico, midnight blue, lemon and blue. Oranda goldfish has a lifespan of about 16 years. People who really want to have a fish as pet should go for it. The shubunkin goldfish is another renowned species of goldfish. Because of its strong, robust nature, it has gain considerable amount of popularity as a pond fish. It has a tender and leaner body and is found in a variety of colors, i.e. brown, red, yellow, and orange integrated with black markings known as ‘calico color’. This color combination makes this fish distinguished from the common goldfish. The colors are prominent almost on the entire body, i.e. from main body to fins. The colors are more prominent on a violet or silvery-blue background. The blue color of the shubunkin goldfish very much in demand and this blue color of the fish based on the quantity of melanin found in the sub-epidermal layers of the fish. The shubunkin goldfish usually have transparent scales. It is a rare species of goldfish which is even hard to find at aquarium stores. The best way to find this fish is to search on the Internet. It was in Nagoya, Japan, where the Jikins goldfish was first developed from the species Wakin Goldfish. Because of its noticeable looks, one can easily discern this species from other species of the goldfish. The Jikins goldfish is often referred as Peacock Tail Goldfish because of its unique caudal fin. If you closely observe the Jikins goldfish on the backside, you will have an ‘X’ type looks dispersed into four parts. Except for the dorsal fins, all the other fins of jikins goldfish are in pairs. It has a streamlined body with rather sturdy impact. Telescope goldfish is another species of goldfish got its name for the fact of having large, projected eyes. Telescope goldfish has many other names, i.e. Globe Eye Goldfish, Dragon Eye Goldfish and the Japanese word Demekin. Telescope goldfish are found in varieties having three different shapes of eyes, i.e. the dome shaped eyes, the flat eyes and the round eyes. The dome shaped eyes are broader at the base and gradually get narrower towards the top. The flat eyes are nothing but flattened in shape. The round eyes on the other hand are characterized by various degrees of attachment on the head. For instance, there is a telescope goldfish having round eyes that seem to give an impression as if they float away in the water. Similarly, there are other goldfish with more than half of the eyes crafted into the head. Irrespective of the shape, they all possess the eyes large and projected out. Veiltail goldfish is another species of goldfish with striking appearance. Veiltail goldfish is equally admired among the breeders and keepers. It was perhaps in 1893 when veiltail goldfish was developed in the United States from the metallic fish brought from Japan. The first veiltail goldfish appeared on the seen somewhere in 1920 and was given the name Philadelphia Veiltail Goldfish. The presence of calico markings on the body of the veiltail goldfish are due to its cross with the globe-eyed goldfish of calico color. This goldfish is given the name Manyu having feather-dressed long fins, in Asia. A lifespan of veiltail goldfish is about 10 years. The veiltail goldfish older than five years is not often considered for breeding purposes. Though, you can keep this fish in the ponds but as this isn’t as stronger as other species of goldfish, it is better to keep this fish in the indoor ponds separate from strong species. This species of goldfish are known to be one of the oldest species of goldfish because of its long history that dated back to 800 years. It was originated in China several hundred years ago. Egg goldfish is often associated with relatively newer species, i.e. Celestial Goldfish, Lionhead Gold fish and Ranchus Goldfish. It is called egg goldfish because of having shape like an egg. It has two tails and dorsal fin are absent in it. Lionhead goldfish is another admirable and adorable species of goldfish. These are normally found in light colors with a hint of red light above the eyes. The average lifespan of this fish is 5-10 years. It grows to the length of 6 inch. They thrive well in the tanks where water temperature is around 60 degrees. Pom pon goldfish is another popular pond fish known for having unique, long tailfins. 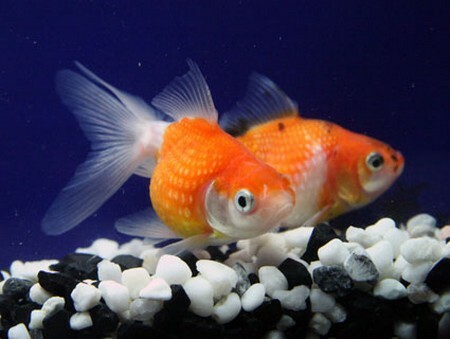 Pom pon goldfish grow to the length of 5 inch and have a lifespan of about 10 years. It is a freshwater fish usually kept in ponds. Above mentioned are some of the common types of goldfish. There are many others. Each and every variety has its own characteristic features and attributes. It is important to note here that goldfish usually enjoy living in groups. So, keeping a single fish in an entire pond may affect the growth and agility of the fish. While keeping different species of the goldfish in a single tank or pond, make this thing sure that aggressive varieties should not be kept with gentle ones as they may harm or injure them. Before choosing different species of goldfish, keep the compatibility of different varieties in mind. Goldfish are most of the time easy going and you need not to take a lot of care, but this too depends upon the variety you choose and the environment you give them. You can start with a tank minimum of 25 gallon and gradually increase the size with time if required.